An errant bat flew into the side of plate umpire Jeff Kellogg's head, prompting him to leave Sunday's action. 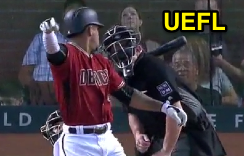 Flying foul bat slams into Kellogg in Arizona. With two out and one on in the bottom of the 7th inning of Sunday's Marlins-Diamondbacks game, Diamondbacks batter Ketel Marte popped up a 3-2 changeup from Marlins pitcher Chris O'Grady, losing his grip on the bat, which crashed into the left side of Kellogg's traditional-style facemask. Though Marte's fly ball resulted in the third out of the inning, Kellogg remained behind the plate through the first batter of the 8th inning before leaving the contest. 1B Umpire James Hoye assumed plate duties with 2B Umpire Tim Timmons and 3B Umpire Tom Woodring remaining on the bases. In addition to becoming the new first base umpire, Timmons also served as acting crew chief for the final two innings of play. Relevant Injury History: Kellogg left a game in Atlanta on April 23, 2016 due to a foul ball injury to the jaw. On September 8, 2012, Kellogg similarly was struck by a foul ball in Anaheim, deemed "a pretty bad migraine" by the Angels training staff.